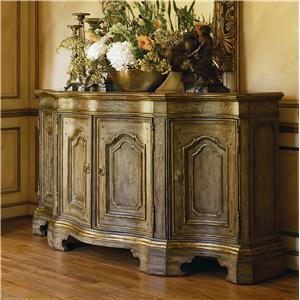 This four door credenza serves as a beautiful and functional storage piece for your formal dining room. A versatile combination of drawer and door storage accommodates all of your dining storage needs. Three drawers and two doors line the sideboard's front, providing suitable storage space for flatware and related items. 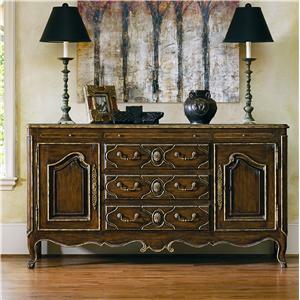 Pull-outs on the sideboard's top feature antiqued knobs for enhanced style. A Madeira Marble top crowns the credenza with a durable serving surface and is accented with gold leaf for a gilded finish. 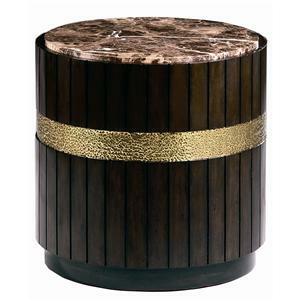 Luxurious materials - wood, granite and metallic accents - converge to create an occasional table with high end appeal. Vertical wood slats surround the table for a bold, sculptured look. A luxe Madeira marble top crowns the base, providing a subtly mottled surface that is as beautiful as it is durable. Decorative hammered brass trim wraps the base to create an intriguing contrast to the dark wood finish. Pair with the coordinating 18" bunching table to create a unique cocktail table configuration. Adorn your dining table with the classic silhouette and beautiful upholstery of this dining side chair. 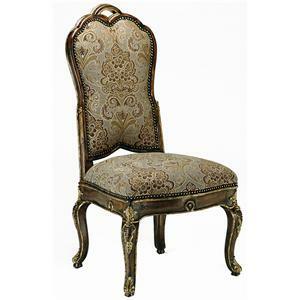 An elegant carved wood frame features cabriole style legs, detailed accent carvings and a uniquely shaped splat back for true traditional style. Elegant upholstery wraps the seat and seat back for enhanced comfort, while acanthus leaf accents and nailhead trim completes the timeless appeal of this dining chair. Shown in Old World Briar with Aged Vintage gold trim. Further defining each piece is the ability to customize. Accent your traditional living room with the classic look of this end table. Slim cabriole legs add graceful curves to the table's base, which features a kidney shaped shelf for storage or display purposes. A shaped apron and oval top are accented with gold leaf for a gilded look, while two drawers at the table's center are topped with exquisitely crafted key and keyhole hardware. Shown in Old World Briar with Aged Vintage Gold Leaf trim. Further defining each piece is the ability to customize. This sensational credenza features a chic, contemporary design and ample storage capabilities for an artful blend of form and function. 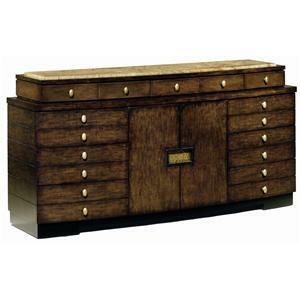 Nine square drawers adorn the credenza's center and feature a bold, inverted design crowned with hammered kn0bs. An additional five drawers line the credenza's top, offering additional storage space for serving pieces, flatware and related dining accessories. This carved pedestal center table features a beautiful surface that adds classic style to any space. A clear glass top with beveled edge rests atop decorative metalwork to create an intriguing multidimensional effect on the table's surface. 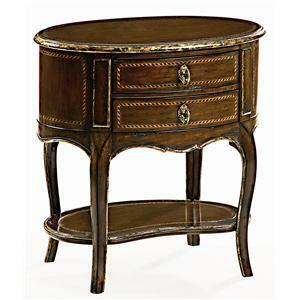 Hand carved details and antique brass feet adorn the table's pedestal base with classic style. 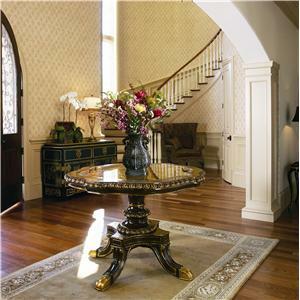 Place in your entryway or foyer to create a beautiful and inviting focal point that reflects your traditional tastes. Shown in Old World Sumatra with Aged Gold Leaf trim. 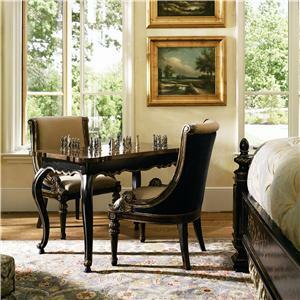 This elegant game table features a delicate design and checkerboard top for a unique addition to your living room or office. Classic cabriole legs frame each corner of the table and connect to the carved apron in a single motion for enhanced style. A rectangular top with carved edges features a checkerboard at its center for truly classic style. The table's base is trimmed with gold leaf for a gilded finish. Further defining each piece is the ability to customize. 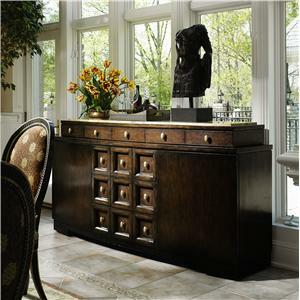 This contemporary dresser represents an artful blend of form and function. Two large doors at the dresser's center are crowned with a metallic insert for a bold style reminiscent of Oriental designs. Six drawers frame either side of the doors, while an additional five drawers line the dresser's top, offering space for lingerie, jewelry or similarly delicate items. A Copper Canyon granite top lends a beautiful marbled look to the dresser's top, offering enhanced style and a durable surface for decorative accents. 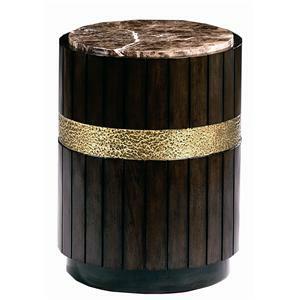 Luxurious materials - wood, granite and metallic accents - lend this round occasional table a designer look. Vertical wood slats surround the table for a bold, sculptured silhouette. A luxe Madeira marble top crowns the base, providing a table surface that is as beautiful as it is durable. Decorative hammered brass trim wraps the base to create an intriguing contrast to the dark wood finish. Pair with the coordinating 24" bunching table to create a unique cocktail table configuration. This elegant sideboard's versatile combination of drawers and doors accommodates all of your dining storage needs. Three drawers and two doors provide suitable storage space for flatware and related items. Three pullouts on the sideboard's top complete its enhanced storage capabilities. Classic design elements like antique brass hardware, aged gold trim and a Madeira Marble top complete this beautiful yet functional storage piece. Shown in Old World Briar with Aged Vintage Gold Leaf trim. Further defining each individual piece is our ability to customize. Old World or contemporary, formal or relaxed, we offer over 550 distinctive fabrics and leathers and 50 decorative finishes in warm, neutral color palettes. These are complimented with dozens of exquisite trims and embellishments. Our hardware is custom designed for location and item. Pulls, rings and knobs are exclusively designed and molded using a mix of materials and metals that transcends the pure function of the piece. Create your unique comfort. Think of it as décor without limits.